Whether you want to travel, communicate with friends or colleagues, reconnect with family, or just understand more of what’s going on in the world around you, learning Brazilian Portuguese will expand your horizons and immeasurably enrich your life. 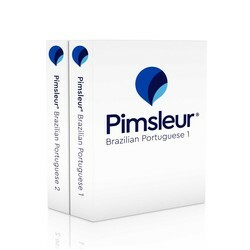 This Brazilian Portuguese program includes all of Pimsleur’s Brazilian Portuguese Levels 1 & 2. 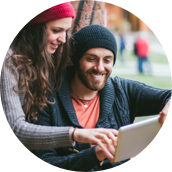 With this program you start from zero, first learning survival phrases and vocabulary, and eventually progressing to a mid-intermediate level of speaking, understanding, and reading Brazilian Portuguese. Every lesson contains an introductory conversation, and isolated vocabulary and structures, as well as full practice for all vocabulary introduced. Emphasis is on pronunciation and comprehension. At the completion of this course, you’ll be able to speak comfortably about things that happened in the past and make plans for the future; you’ll speak confidently using your wide-ranging vocabulary, and experience the Brazilian Portuguese language and culture with a deepening insight. Reading Lessons are included to provide you with an introduction to reading Brazilian Portuguese. These lessons, which total about one hour for each level, are designed to teach you to sound out words with correct pronunciation and accent.